When an Initiative (or Release) is created, it is initialized as a “Concept”. It could be added to a Portfolio where it can be prioritized against other Initiatives/Releases. When the Concept is confirmed, it can become an official project: it is automatically done by passing one Governance Milestone, usually the first one but not mandatory. An Initiative/Release can be marked as “confidential”: its view will be restricted to authorized persons. It can also be archived either because the Concept will never be implemented or the project is completed. A Portfolio is a way to group Initiatives under the supervision of a Portfolio Manager so that synergies can be obtained. Portfolio: a generic group of Initiatives. See Portfolio page for a list of all the standard Portfolio's attributes. The life cycle of each Initiative or Release is governed by a Life Cycle Process (selected initially during the creation). 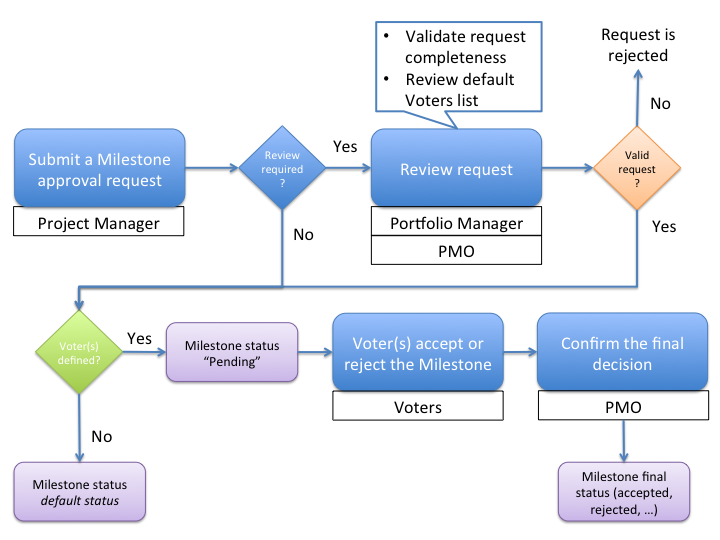 A Life Cycle Process is a set of Milestones that support the company governance by providing validations/checkpoints. Then either the Request need to be reviewed and validated (mainly to ensure completeness and adherence to the Company's Governance process) Or it directly enter “Approval part”. And finally, a PMO Officer needs to confirm the decision so that the Milestone can effectively be accepted or rejected.